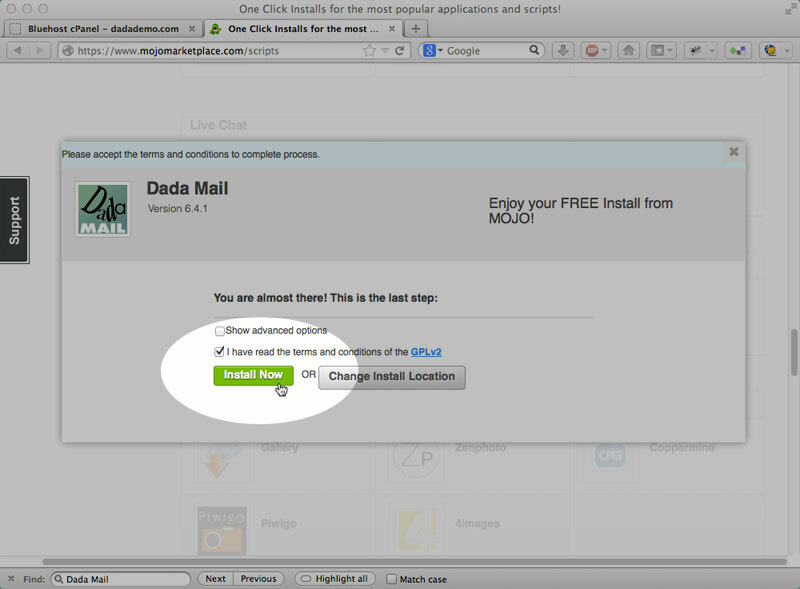 Installing Dada Mail on the Mojo Marketplace. 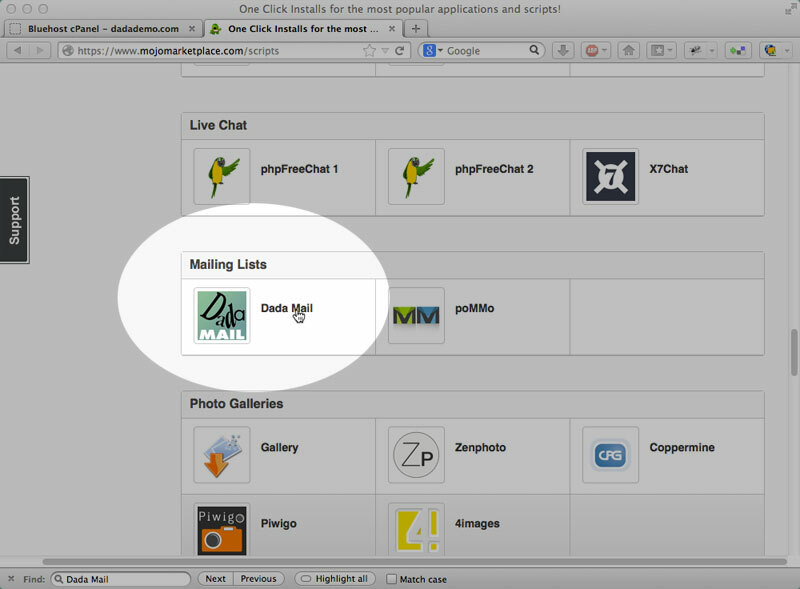 Simple Scripts/Mojo Marketplace (henceforth, only reffered to as, "Mojo Marketplace") is a great way to get started with Dada Mail, as their easy installer makes it painless to begin using Dada Mail. Mojo Marketplace has, in its history of offering Dada Mail, sometimes changed the method that they install Dada Mail. Since starting to offer Dada Mail, their installs are less and less different from the install directions we give, and thus, it's much easier to upgrade. These docs were written on 7/12/13, and go over installing v6.4.1 of Dada Mail, and upgrading to v6.5.0 of Pro Dada. 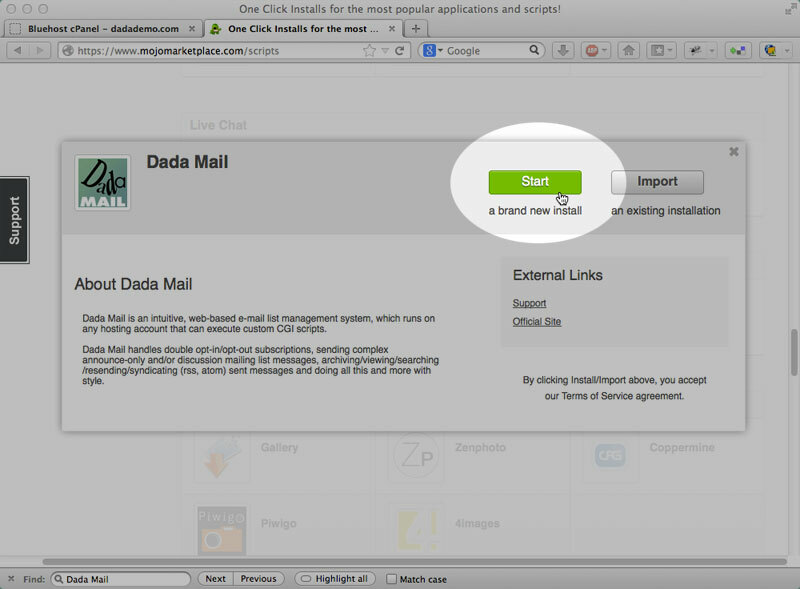 Before we upgrade, we're going to quickly go over how we've installed Dada Mail, using Mojo Marketplace. 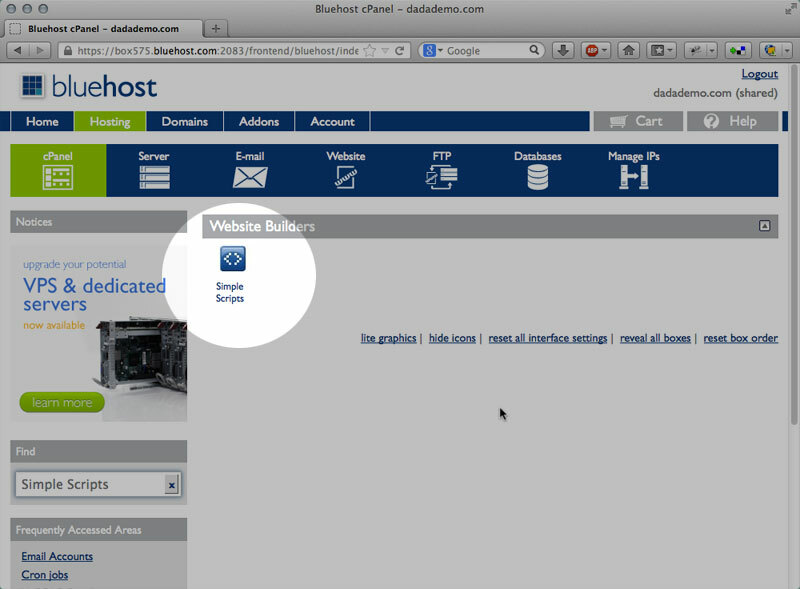 This demo is on a cPanel-based hosting account on Bluehost. Please feel free to skip this section, if you're familiar with how Mojo Marketplace installs Dada Mail. 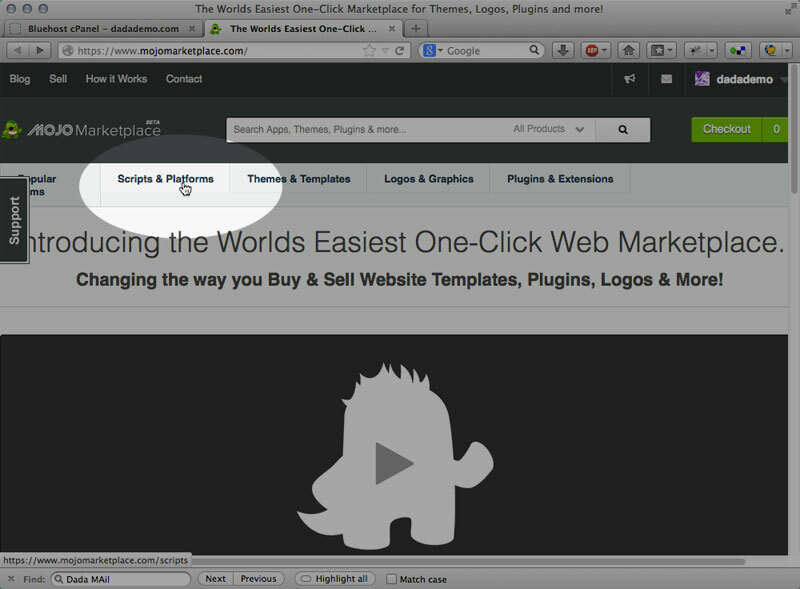 Click the, Simple Scripts/Mojo Marketplace button to enter the Mojo Marketplace. This should open a new window/tab in your browser. When the page has refreshed, click on, Dada Mail (it's under Mailing Lists). That'll popup the modal menu to configure Dada Mail for your account. and when the modal window refreshes, pick a directory to install Dada Mail under. 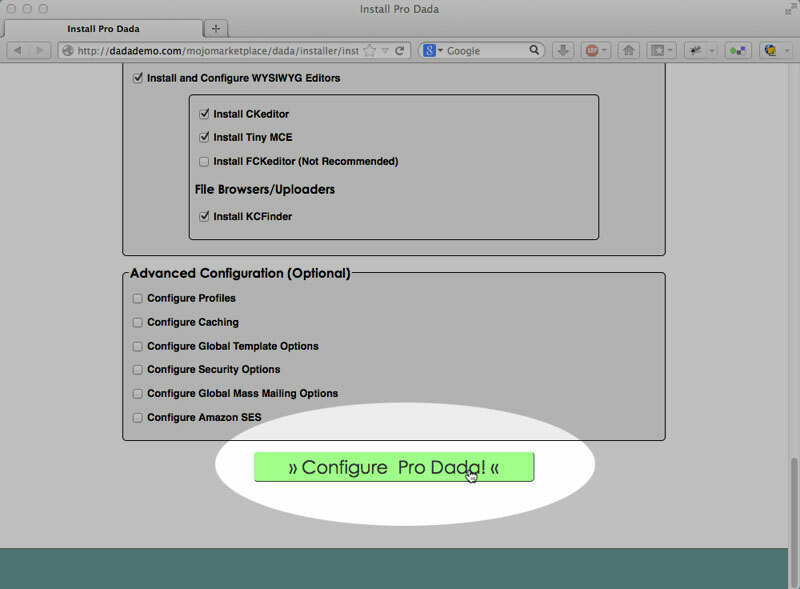 Thankfully this installer will install the full, dada directory under whatever you pick, which makes upgrading to your own install way easy. I'm going to use the directory, mojomarketplace as my own directory, just to make things obvious. Once you've enter in the directory to use, click the button labeled, Check Domain. The installer takes a few seconds to do its job, but should come back with a screen saying everything's all set, and allow you to start working with your fancy, new Dada Mail. All set! 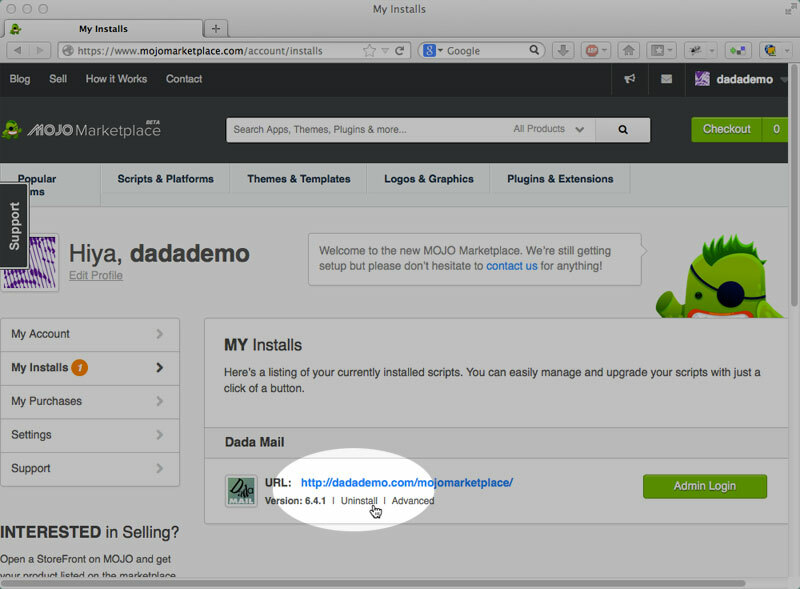 And that's how you install Dada Mail using Mojo Marketplace. The first step you want to take before upgrading your Mojo Marketplace installation of Dada Mail is to decouple your Dada Mail, from Mojo Marketplace. This is done within the Mojo Marketplace. Once again, enter into Mojo Marketplace, and click on Scripts and Platforms. Click on the button labeld, View My Installs. 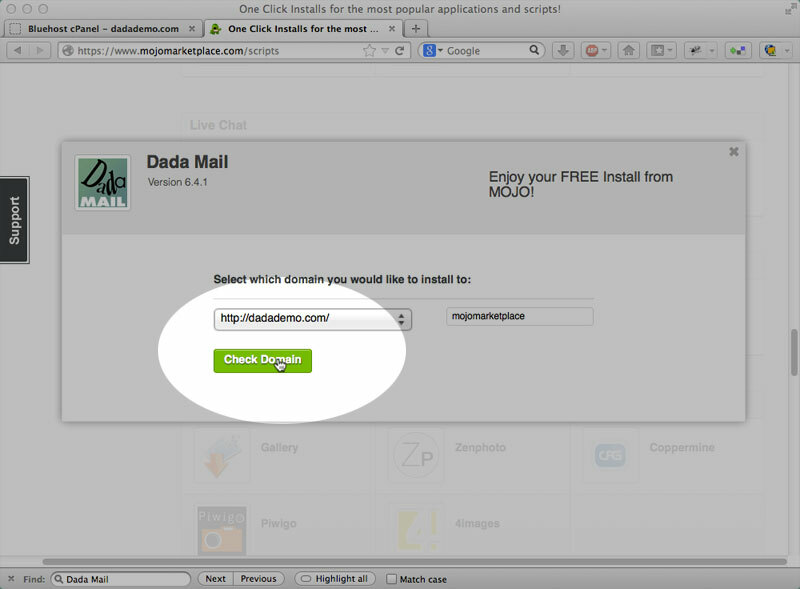 The screen should refresh and show all your current Mojo Marketplace installations, including your Dada Mail. 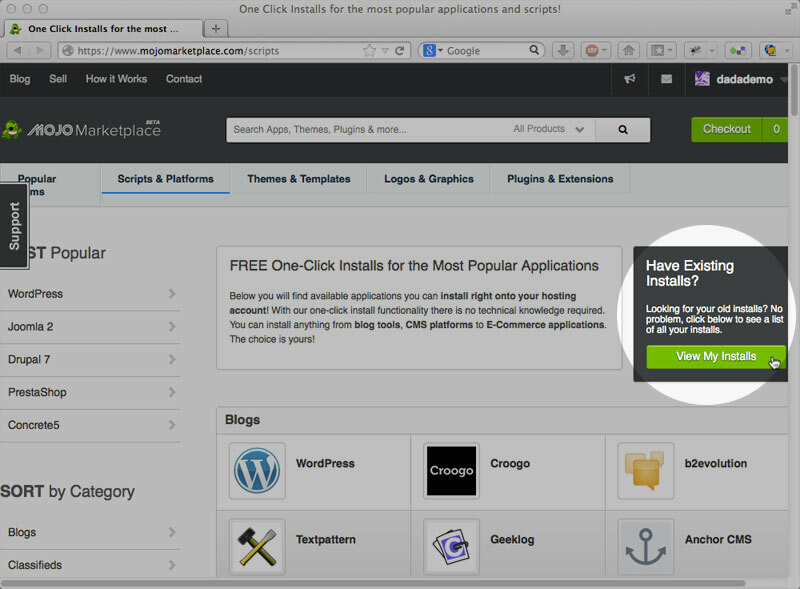 A modal window will appear, giving you a few, again - slightly confusing options. Click the button labeled, Remove From List (Option #2), and then confirm this removal. This option will leave your installation of Dada Mail completely alone, yet stop Mojo Marketplace from administrating it. 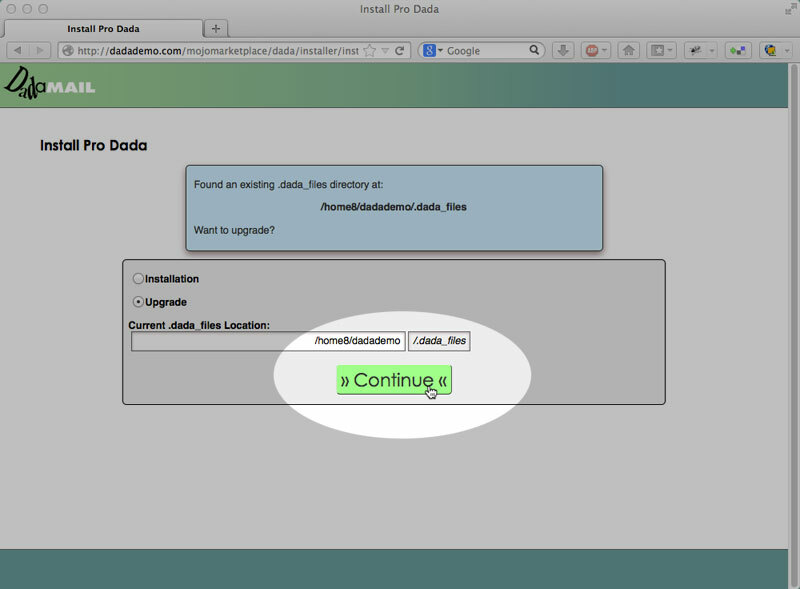 Once that's completed, you can start administrating the intallation of your Dada Mail, yourself. mojomarketplace is our installation directory. 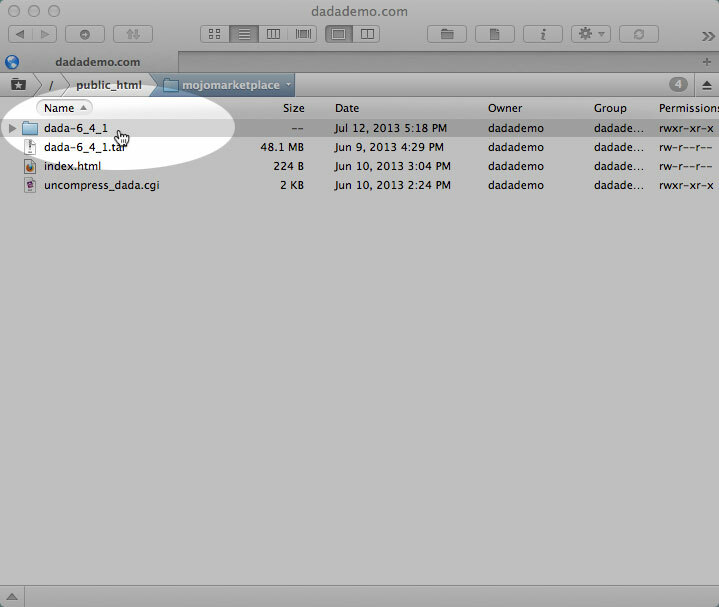 If we peak inside this directory, using an FTP program (Transmit, in this case), or using the File Manager, provided with cPanel, we'll see that within this diretory is another directory named, dada - and THAT's Dada Mail, installed on your account. Change the permission of the, uncompress_dada.cgi script to, "755": this allows this script to be executed, and the script itself handles a whole bunch of things for us, so we don't have to. Simply visit this URL in your web browser to have this script unroll this distro, and set things up. 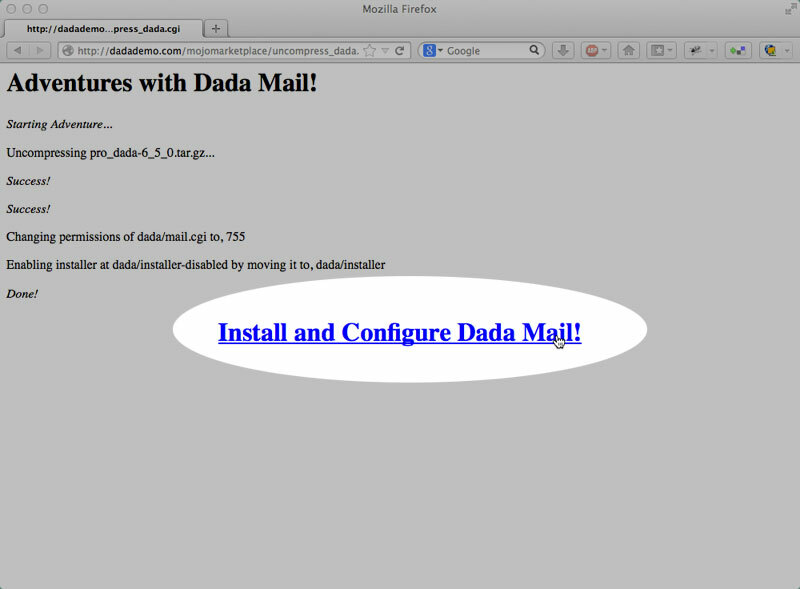 Click on the large link on the bottom to start up the included Dada Mail Installer! What's fantastic about moving from a Mojo Marketplace installation of Dada Mail and your own self-installed copy of Dada Mail/Pro Dada, is that there's nothing you will now need to reconfigure - all the values presented to you are just fine! 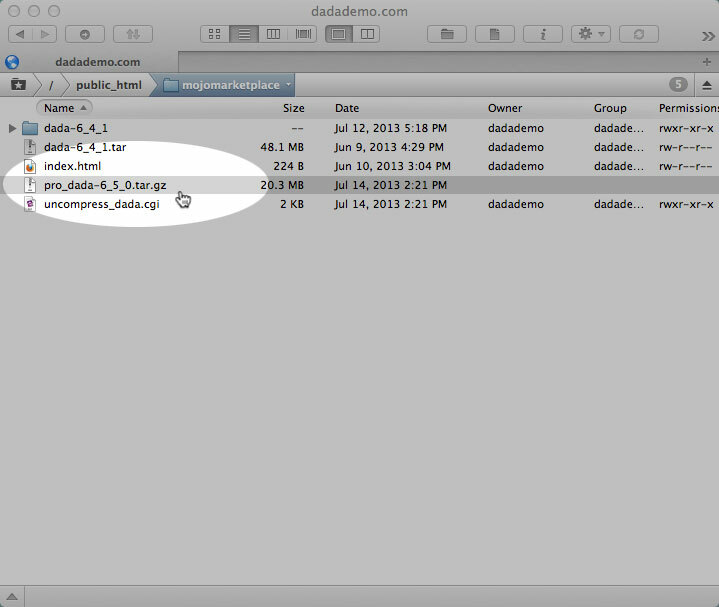 If you're happy with how everything looks, simple click on the button labeled, Configure Dada Mail/Pro Dada! at the bottom of the screen. 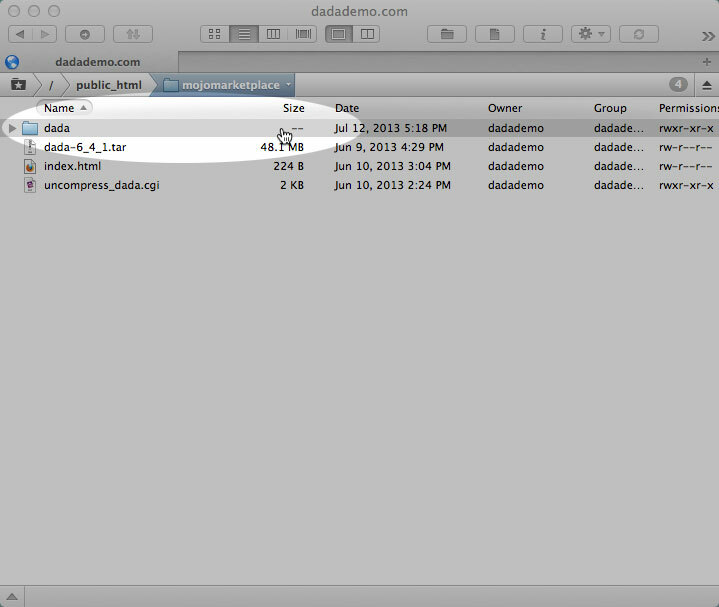 Click on the button labeled, Move the, 'dada/installer' Directory, Disable the, 'install.cgi' script, and then the button labeled, Start working Dada Mail/Pro Dada!. Once the screen is refreshed, you've successfully self-installed your own copy of Dada Mail/Pro Dada, starting with a Mojo Marketplace installation of Pro Dada. Good work!